A judge has overturned Alaska Senator Ted Stevens's conviction for corruption because of mistakes made by prosecutors during his trial. The ruling follows a request by officials at the US justice department for the conviction to be reversed. 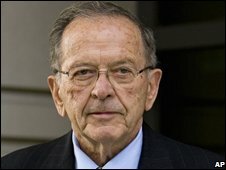 In October 2008, a jury found Mr Stevens, a Republican, guilty of lying about gifts and free home renovations he received from an oil company. Mr Stevens went on to lose his Senate re-election battle the following month. He was the longest-serving Republican senator, having first entered the chamber in 1968. US District Judge Emmet Sullivan said the prosecutors' misconduct during the trial was the most serious he had ever seen. "In nearly 25 years on the bench, I've never seen anything approaching the mishandling and misconduct that I've seen in this case," he said. Prosecutors made a number of errors during the trial, justice department officials said, the chief among which was the failure to make available notes of a crucial interview in which a witness made a statement that contradicted evidence he gave later under oath. Justice Sullivan has appointed a special prosecutor to investigate the justice department's trial team for possible criminal contempt charges. "I always knew that there would be a day when the cloud that surrounded me would be removed," Mr Stevens said in a statement. "That day has finally come. It is unfortunate that an election was affected by proceedings now recognised as unfair."